THANK YOU Sun Life Financial Centre for your generous seasonal giving! Tree Ottawa would like to thank Sun Life Financial Centre for their generous seasonal donation of $900.00. Because of renovations to prepare for the Light Rail Transit Parliament station, they had to clear the 100+ plants from their atrium. Seeing this is an opportunity, Bentall Kennedy Property Management organized an atrium plant sale fundraiser, asking for voluntary donations which were then matched by Sun Life Financial Centre. Not only was this an excellent fundraising initiative, but it also opened up an opportunity to discuss the importance of keeping the established trees alive. Thank you! 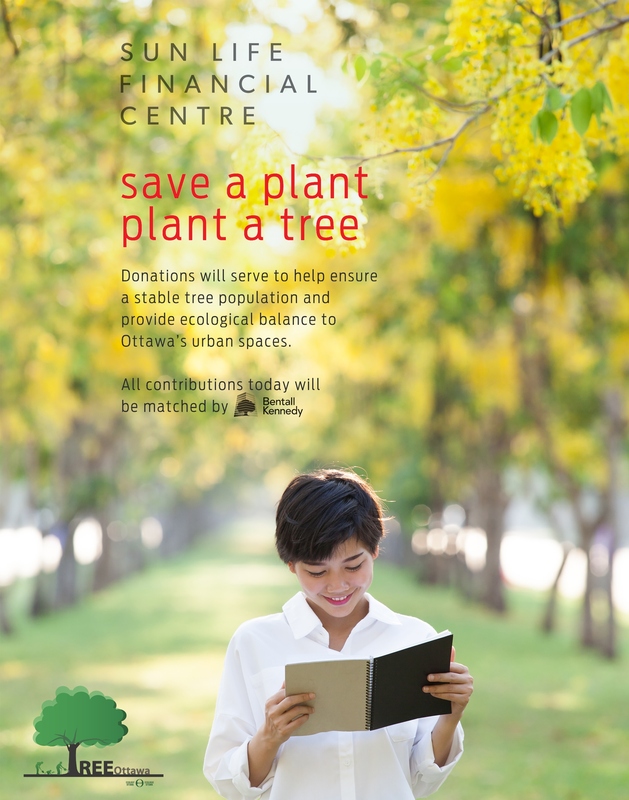 Sun Life Financial Centre has kindly donated to the Tooker Gomberg Greenspiration Fund, which will contract Ecology Ottawa to carry out activities in line with the objectives of Tree Ottawa – to protect, plant, and promote trees. If you would like to help Tree Ottawa with their objectives and receive a charitable tax receipt, please donate through this website to the Greenspiration Fund: https://www.canadahelps.org/en/charities/tooker-gomberg-greenspiration-fund/. You will automatically receive a charitable receipt once a donation has been made. ← Congratulations to St. Anthony School for winning the Aviva Community Fund!